Many people like the idea of learning piano by ear, but don't necessarily know that much about how it works. There's a host of unanswered questions jumbling around your head anytime you start to consider it! Is it any easier/quicker/better than learning to read sheet music? Is it just for learning pop songs? How do I get better/quicker at it? 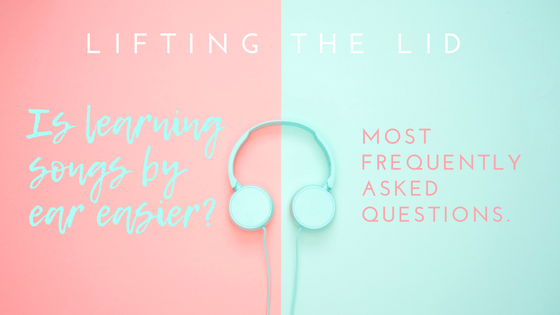 When these questions are left unanswered it can leave a would-be pianist feeling hesitant and even delay getting started. In this post I've answered the most frequently asked questions that I receive as a piano tutor and a top piano writer on Quora. The aim of these answers is to help overcome any of the hesitancies a new piano student may have about learning by ear, so that the piano journey can begin with full confidence! How long does it take to learn a song by ear? Once you have learned the tried and tested Songs By Ear process to teach yourself a song by ear, all you have to do is follows the steps as outlined in the course. It may take anywhere from 30 minutes to a few hours to learn a song from scratch depending on whether you are already familiar with how the song goes, or, whether you are hearing it for the first time when you decide to learn it. This can seem like a long time to spend working out a song but this is the FIRST song that you are working out from scratch! This is the first time you are relying solely on your own musical ear! It will be slow going the first time you give it a try and you can expect a fair amount of hesitancy and second guessing but it’s only going to get quicker and easier from there. You’ll see a huge improvement once you start working out your second song and then more improvement again on your third. As you strengthen your skills, train your ear and become more familiar with the full process, you’ll grow to a stage where you can learn entire songs by ear in 20 minutes or less. Is learning by ear just good for pop songs? No. Learning by ear is good for any type of song, any style, any structure. 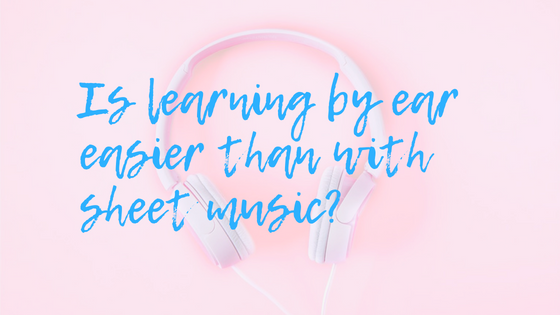 The reason the Songs By Ear course starts with using pop songs to learn by ear is that most people are already familiar with the standard form and playing style of a typical pop song. The best tool at your disposal when learning a song by ear is your familiarity with the song. Beginning with a song you already know very well is going to be a lot quicker and easier than choosing a lesser known song. While you are training your musical ear and becoming used to the learning-by-ear process it’s good to start somewhere basic, with a typical simple pop song. Once you feel more confident with your ear-learning skills you can begin to branch out into other genres of music. Sign up to my FREE ear-bootcamp '5 Days to a Better Musical Ear' and get your ears into shape! This bootcamp is completely online (so anyone can join in) and it's free! You'll get daily live videos, activities and lessons to get you not just hearing but actively listening so you're ready to start learning songs! When you first start learning songs by ear you won’t necessarily know if you are getting it right. This is why you need a course to guide you through the process and correct you when you go off track. Your very first learning-by-ear challenge (and all challenges) in the Songs By Ear course have all the answers listed in the accompanying Cheatsheet. This allows you to do the work and then check back against the answers to make sure you’re on the right track. Once you feel more confident with your abilities you will know instinctively whether you are playing it right or not. By using your newly-trained ears to compare the reference track to what you are playing, you’ll soon be able to identify any differences and decide when you are playing the song perfectly or require some additional work to get it just right. How do I get quicker at teaching myself songs? Do it over and over and over again. Learning songs by ear on the piano is all about strengthening your musical ear over time and setting yourself challenge after challenge. This is why I include a 30-day Challenge of daily ear-assignments as a bonus with the Songs By Ear course. This keeps you practising your skills after you complete the course to ensure that the skills you’ve learned become engrained. As your knowledge grows and your musical ear strengthens, every note will come to you quicker than the last. Every new song will be both familiar in parts and also present new challenges, so the more songs you teach yourself, the more challenges you issue to your ears: the quicker you’ll identify the piano parts. Is learning by ear easier than reading sheet music? For basic songs or pieces, yes, it is easier to learn by ear. Is it quicker? Yes, that too. If you want to learn to play songs as quickly as possible, then learning by ear is the fastest way to get there. However, once you get to a higher level of playing, learning to read sheet music is helpful for learning complex pieces accurately. Learning by ear is fantastic for learning a song quickly but to play a technically involved piece exactly as it was intended by the composer, reading sheet music is preferred and worth the time that it takes to master the skill. My advice is to learn piano by ear to begin with and once proficient you can begin to learn to read sheet music. At this point it will be easier to pick up than if you’d started with reading sheet music from the beginning. Pianists who can do both are more well-rounded musician’s with a deeper understanding of music as a whole. I can teach myself a simple song by ear, now what? Don’t stop! Do a song that isn’t basic! Do a song of a different genre! Try learning a song by ear which has absolutely no piano in it! Try learning a song by ear that has no acoustic instruments at all, only electronic! Just as we exercise our muscles to grow strong, when you continue to challenge your ear you will be rewarded with growth. The goal is to be able to hear a song once and instantly be able to play it on the piano. That’s the golden egg. But to get to that payoff it’s a long, step-by-step, inch-by-inch journey. Though it takes some work to get to that goal, at every point along that journey you’ll achieve results and be proud of where you are now and how much you’ve already progressed. Learning by ear isn’t just about songs either: it’s about becoming a better all-round musician. It will inform the way you write songs and greatly improve how you improvise. To train your musical ear, is to become a better musician song by song, note by note!